LEFT: Stack + Co. incorporated natural materials from the New England vernacular (stone, red cedar, green fir trusses, pine barnboard, and bluestone) to build a modern house. ABOVE: By using exposed steel plates and steel connectors on locally sawn fir trusses, a traditional element is made to feel contemporary. 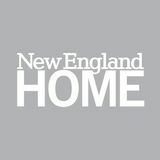 RIGHT: The goal was to design a strikingly modern home in a classic New England town; western red cedar, expanses of glass, and stucco blend the project with its site, even as it stands out from its neighbors. LEFT: At Mayhew Wine Shop, hickory plywood sheets with CNC-cut perforations allow the display modules to be easily moved and reconfigured; the result is a flexible system for racking the wine and organizing products. 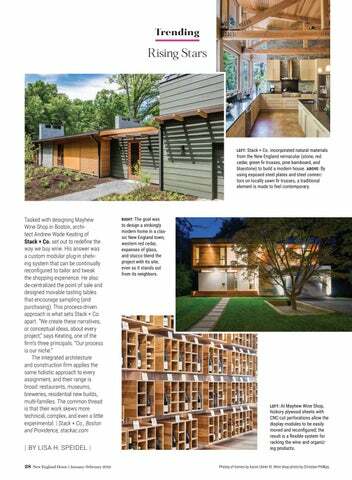 Photos of homes by Aaron Usher III. Wine shop photo by Christian Phillips.